Just watch, and you will see in my pitiful big brown puppy eyes that she is teasin' me with a treatie off camera!!!! Now, she thinks it's funny that my leggies are shakin'!! Will she let me have it???? NO! Not until she gets video of my leggies shakin'. Who knows!! I thinks the woman is as fruity as a bag of Skittles!!!!! YUPS! It says it right here!!!! I also did a little "Tissue Paper Therapy"
"I gots caught again" happy dance!! Tried to see if I could gets the burdie out of his cage. Who knew 'taking it easy' could be so tiring!! Hey puppers and kittehs, FABulous news!! She keeps sayin', "Your suppose to take it easy!, I'm not chasin' you." Oh, come on Ma!!! Chase me!!!! So I made a lap around the yardie instead...she couldn't catch me if she tried!!! 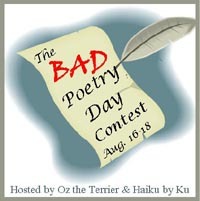 Oz and Ku's Bad Poetry Contest! Ma says I'm gettin' fats. Oh, I gots one of those this mornin' too! Butts Ma made a face like I just ate poo. Anyone wanna give a droolin' Airedale hugs? Okays, don't forgets to vote for me , cause I thinks mine is the worstest!! He decided to try to break the news to a friend of his, a pessimist by nature, and invited him to hunt with him and his new dog. As they waited by the shore, a flock of ducks flew by. They fired, and a duck fell. The dog responded and jumped into the water. The dog, however, did not sink but instead walked across the water to retrieve the bird, never getting more than his paws wet. The friend saw everything but did not say a single word. On the drive home the hunter asked his friend, "Did you notice anything unusual about my new dog?" "I sure did," responded his friend. "He can't swim." THANKS BUNCHES everyone for your POTP ~ it really worked!! Butts, don't forgets that Phantom and Oskar still need some POTP! So let's keep those good vibes rollin' !!!! Hey puppers and kittehs, I had to go to the vetties today. So we've been takin' ALOT longer walkies. Well, Tuesday hours after our walkies I was havin' problems gettin' up. Nothin' serious, just a little slow. Wells, it didn't gets better, and todays it was worse. Anyhu, we gets there and there is a new PAWSOME new receptionist! I loved hers! And she thoughts I was really 'beautifuls'!! And, there was a new vettie, too!! He was also PAWSOME!! So, he gave me some pain meds and sent my hyperbutts on my way! He also said I only needed to lose FIVE POUNDS!! Ma was goin' on abouts 10lbs, and I thoughts she was crazy, butts the vettie said five is good!! After this I crashed in the house. Don't let these pics fool you....I was still hopped up on adrenaline!! So, I could use some POTP to get these druggies workin'! Also, Oskar is havin' some problems with his caboose too! Stop by and give him some POTP too! Okays, it's rest and diet foods for me this weekend! All you doggies, run and jump and do some roachin' for me, okays?! Hey puppers and kitteh's, I gots a complaint. And, well, sometimes it even waves at you!!! You know what I say????? All the better to hear TREE RATS with!!!!!! They make you who you are! 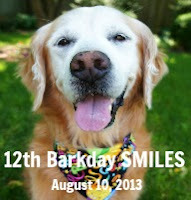 Today is our Pal Sugar's 12th Barkday!!! I am smilin' cause Sugar is such a sweet pal, she always brings a smile to my furry face!! Oh puppers and kittehs, furst Ma has to apologize for the delay in postin' abouts a lot of the FABulous mail I've been gettin' lately. See Ma sometimes gets some nasty my-grains that throw her for a loop, so postin' lately has been kinda sporadic. She will catch up soon!!! She promises!! ANYHU! LET'S GET ON WITH IT!!! Let's get on with it already!! Oooooo, the anticipation is drivin' me NUTTY!!! Okay pupper and kittehs, let's see what's in here!!! Yups! That's right...took the tennis balls and RAN!!!! See, I had to check out the rest of the loot! Nice! Yes, this will do just FINE!! Oh, yes! I had to bring my loofa dog into my tunnel so I could check it out! Ma FINALLY opened my tenny balls and gave me one!!! Yups, you guessed it...into my tunnel for the inspection! Yes! This is a FABulous one! Lookie!!! It's a picture of MOI!!!! Yeah, me neither.....Ma says that's how I'm SUPPOSED to look. Anyhu, after Ma was finished makin' funs of my looks, she finally gave me a taste of the yummy Duck Jerky that was in there! Thanks Bunches Chico, Shiver and Sprinkles!!! !